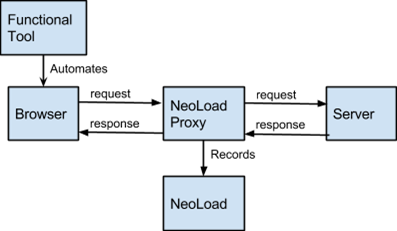 The Design API is the Recording API of NeoLoad 5.1 expanded with new capabilities. The purpose of the Design API is to automate the transfer of a functional test from an external tool to NeoLoad. The idea is to set <productname> as the proxy of the client, typically a Web browser, so that all HTTP traffic generated is sent to <productname> when running the test case. To learn more about the recording of a test scenario, see Record a test scenario.